Gallo Pinto is Costa Ricas's essence. Eaten for breakfast it fills one up well until noon. If you have a hard day's work or a long hike before you this is just the thing. "Gallo Pinto" means speckled rooster and refers to the colour of the rice and beans. Sear onions with the garlic at middle heat. Add beans and cook for 3 more minutes. Add coriander and salsa lizano (or worcester sauce) and stir well. Gallo Pinto is usually served with natilla (sort of a sour cream). Our gourmet Franck serves it with queso crema, which is a kind of cream cheese. Philadelphia spread is a good substitute. Gallo pinto is a central part of Costa Rican food culture. It contains rice and beans, which are the side to almost any local dish. Gallo Pinto was "invented" by using the leftovers from the day before: the "casado" - which used to be separate - becomes a "gallo pinto" when it is all fried together the next morning. Consider that the beans have to lay in water for an entire day before they can be cooked. Cooking them takes another 2-3 hours. Hence the custom to cook plenty in the evening and reuse it in the morning. Of course, Costa Ricans drink coffee along with the pinto. 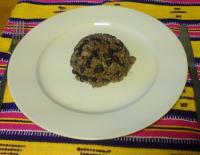 Even though Gallo Pinto consists of Rice and Beans it is not to be confounded with the Caribbean dish "Rice and Beans".